Starry Landscape Stacker makes it possible to produce landscape photographs taken at night that have both low noise and stars rendered as points. It does this by compositing several images taken in rapid succession, shifting the sky as needed to align the stars. A free trial version is available on the developer's website. Display update for almost all tasks is much faster, especially for MacOS 10.14 (Mojave) and later. Pinch zooming is now supported. Zoom level is displayed as a percentage, and can be typed in. Undo/redo of painting and erasing of red dots is by stroke (mouse down to mouse up) rather than by individual point. This should be faster and more convenient for most users. Alignment and composition is typically more than 2x faster than version 1.7. Improved alignment where there are few stars to align (e.g., corners with vignetting). Changing images (with next/prev and arrow buttons) can be slightly slower. (This is a trade off with faster drawing in general). SLS can no longer align images where the camera moved so much that you can see movement at the horizon in the images. Other bugs fixes and UI improvements. Starry Landscape Stacker now requires Mac OS 10.10 or newer. (Was 10.8 or newer). I have used this only 2 times and it works flawlessly. My first attempt was with the Milky Way and mountains in the foreground. My second usage was with the Orion Nebula. I had phenomenal success with the Milky Way shot and am struggling with my Orion shot. I am quite sure my struggle with Orion is the pictures I’m dealing with, not this software. The difference in dark areas between a raw shot and using this software to combine 10 images is amazing. Snow fields are quite grainy in the individual shots, smooth as silk in the final output. Does exactly what I wanted it to do. I’ve used this program primarily for stacking astrophotography images taken with a telescope and it works very well. It’s rejection of satellites and airplane trails is particularly useful . The only limitation is it rejects image sets that are taken too many minutes apart but that can be worked around. The program improves with each update. Support is also useful and responsive the one time I asked for it. How can you feather the paint brush when masking? The paint brush is set to the hardest edge possible and that makes masking a very time consuming and tedeous process. I saw in Ian Norman’s tutorial video that his brush was feathered and there is no obvious way to achieve that in the app. Other than the paint brush feather issue this is a great app and very user friendly! I’ve achieved my best astro shots with the help of this app. Thanks for your feedback. I am glad you have had success with it. I am not sure how Ian Norman's tutorial showed a feathered brush. SLS has never had a feathered brush. The edge of the mask has to have a hard edge--feathered alignment just does not work. I am not sure how having a feathered brush makes it easier to make a mask. Perhaps you could contact me directly and we can find a way to make masking easier for you. 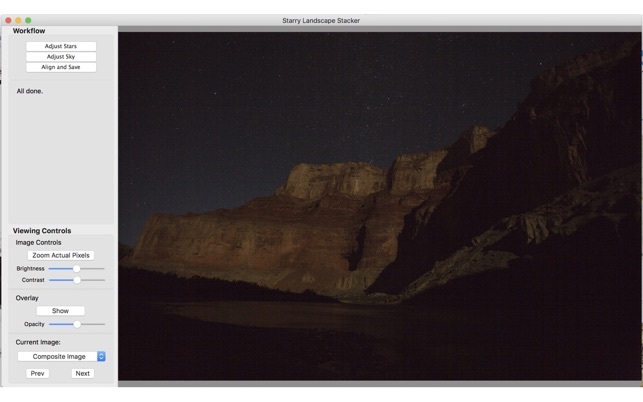 Launch Starry Landscape Stacker, and under "Help" in the menu bar select "Email Developer".